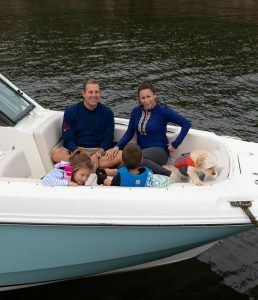 Meet the Zimmers, a Connecticut family using their 270 Vantage to unlock endless possibilities on the water. Most of the world knows the tart little gummy candies as Sour Patch Kids, but to twins Reagan and Parker Zimmer, they go by another name: Power Pellets. It’s an apt description for the 5-year-olds’ favorite boating snack. Out on their family’s 270 Vantage, any grain of sugar they consume is immediately converted into pure, high-octane energy. One minute Reagan and Parker are scanning the shore with their binoculars, looking for lighthouses; the next minute they’re squealing and giggling as they leap off the swim platform, coaxing the family dog, Penny, to jump too. Their mom and dad, Jeanne and Cody, have been known to pop a few Power Pellets to keep up. The Zimmers keep their Vantage on the water at the MarineMax Boating Center in Norwalk, Connecticut, a short drive from their home. During the week, Cody works in ﬁnance in New York City, while Jeanne is Chief Operating Officer of the family. Even when their schedules get hectic, they strive to make boating a priority. Over Memorial Day weekend, they took Reagan and Parker down through Long Island Sound and around Manhattan. The twins got to see Yankee Stadium from the water, and were treated to their ﬁrst real-life look at the Statue of Liberty, something they’d recently learned about in school. Persistence also helped lead them to Boston Whaler in the ﬁrst place. 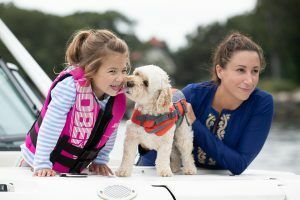 Cody had grown up boating on small lakes in Wisconsin, while Jeanne had occasionally boated around Long Island with friends; life on the water always held a special appeal. By the time they had settled in Connecticut and started a family, the Zimmers knew owning a boat had to be part of the picture. Dreaming of the many possibilities, they began what quickly became an in-depth research project. Boating on the Atlantic proved to be quite a change from those quiet Midwestern lakes familiar to Cody. The ocean presented new challenges like learning the tides and taking care to avoid shoals and reefs. 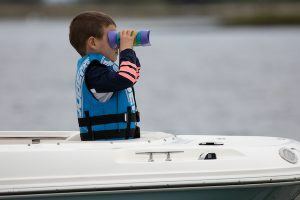 Oliver Calloway — a USCG Licensed Captain who works with the Zimmers’ dealership, MarineMax of Connecticut — walked Cody through all the ins and outs, offering guidance and building the confidence to take on bigger boating adventures. Occasionally, Cody and Jeanne use the 270 Vantage for date nights, taking advantage of the boat’s grill to cook sausages or seafood before cozying up in the cockpit until sundown. Most often, though, the whole family is included in the fun. 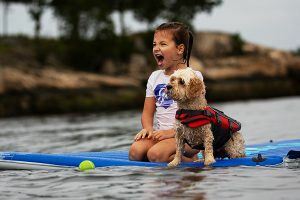 To see Reagan and Parker paddling around in the water with Penny, or huddled together on the portside lounge seat, whispering in twin language, it’s clear they’re having the time of their lives. Watching their little ones in action, Cody and Jeanne clearly are, too.